In a blog on the O’Neill Institute website, Drew Aiken writes that we are addressing tuberculosis (TB), one of the most ancient diseases, with approaches nearly as ancient. This includes over-hospitalization, use of involuntary isolation, and in some countries, use of discriminatory and punitive laws which violate human rights and impede the fight against TB. 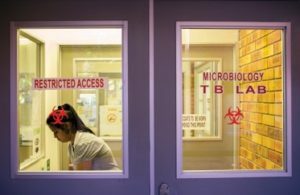 One of the issues identified is that the newer TB medicines for drug-resistant strains are generally unavailable to those who need them most. Only 5% of people in need have access to these more effective medicines. This means that people have no choice but to take older, more toxic drugs which cause deafness and psychosis and only cure 50% of people who take them. Another problem raised in the blog is that in some countries, public health laws, criminal laws, and treatment protocols lack a human rights-based, participatory and patient-centered approach.